The history of opium in China, prior to the publication of this volume, was traditionally approached as a deplorable episode in the history of nineteenth-century British imperialism, when British traders exported vast quantities of opium from India to China in order to balance their payments in the China trade. 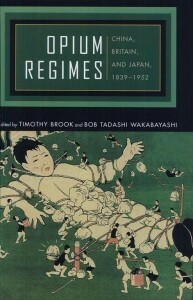 The volume takes a much broader perspective by introducing new work being done in the 1990s by historians of China, Japan, Southeast Asia, and the British empire on the role of opium not just in Sino-British trade but in a wide range of economic, political, and cultural spheres. The coordinating concept is “regime,” signifying a system in which an authority declares its right to control a substance and elaborates policies and mechanisms to maximize the benefits of that control. Among the authorities handling opium in China that are examined in this book are the British East India Company, the late-Qing state, the Chinese Opium Suppression Commission, the Japanese Military Police, and the Interior Ministry of the PRC, among many others. Their efforts to restrict, but also at times to profit from, the sale of opium did much to define the social and diplomatic fabric of China between the 1830s and the 1950s. This entry was posted in Publications and tagged Book, chinainasia. Bookmark the permalink. Post a comment or leave a trackback: Trackback URL.